﻿ Enjoy our kitchen textiles of the best quality made in Provence ! Provençal fabrics are particularly suited to the needs of the kitchen textiles, thanks to the practical aspects of cotton in its various forms, and gay colors. In printed canvas, it fulfills the functions of protection of the cook. For example, quilted cotton can take the shape of gloves to take the dishes out of the oven. 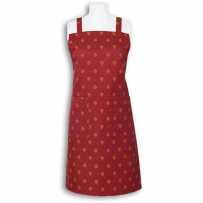 The kitchen aprons can also be woven Jacquard for a very elegant presentation. Dish towels come in two ways. The quality of the Jacquard woven tea towels is so beautiful that you can take them to the table. The honeycomb cloths decorated with embroidery, put fantasy in the kitchen daily. Hand towels, meanwhile, harmonize with the previous ones to create decorative sets, with a terry of high quality. A large selection of kitchen linen, essential and studied to satisfy you, is offered in these pages. Our most beautiful collections are represented. The colors are singing, the decorations typical, or in reference to the terroir of Provence. Some items are sold in batches for obvious practical reasons. Choose your favorite patterns to cook while staying clean and safe.